The Spokane Arts Commission announced the winners of its biannual All-Media Juried Show last week at the First Friday Artist Reception at the Chase Gallery. Meg Shiffler, gallery director for the San Francisco Arts Commission, judged the every-other-year competition. This year’s winners were Chase Boston for his digital print Blood Meal, Erin Mielcarek for her ceramic Single Again and Ellen Picken for her graphite-on-panel drawing St. Gertrude’s Chasm. All the winners are Washington-based artists. In a letter to the public, Shiffler says that she looked for honesty in the winners and finalists. “To me (honesty in art) means that the works feel fresh, the materials are not overworked and there is a genuineness about them that draws the viewer in,” Shiffler says. 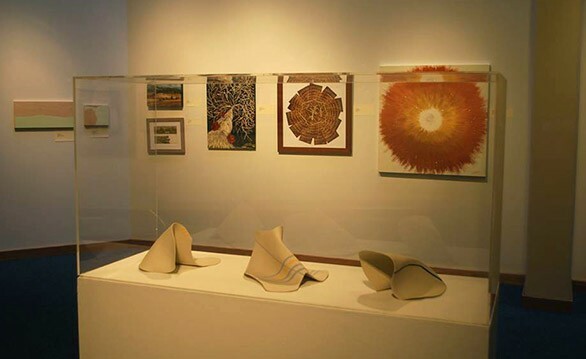 More than 300 works of art were submitted for the exhibition this year, but Shiffler chose about three dozen pieces for the show at the Chase Gallery in City Hall, which will continue until Sept. 27. The competition, which is regional, drew submissions from artists all over Washington, Oregon and Idaho. Submissions on display include etchings, wood mosaics, India ink and oil paintings, photographs and mixed media. One artist listed “collected tears” as a medium in her ceramic piece. The Chase Gallery is in the basement of City Hall, outside of the City Council chambers. It is open during regular business hours and through council meetings on Mondays.